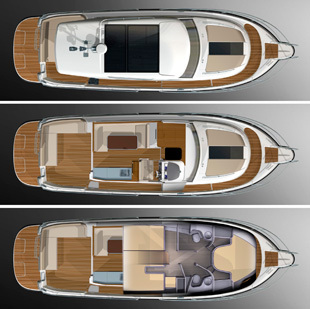 The new Nimbus 405 Coupé will take its place as the flagship of the yard’s Coupé range when it hits the water at the end of the year. It’s not a huge step in a new direction for the Swedish yard but rounder edges and cleaner lines do at least add a modern tilt to the tried and tested Nimbus formula. The 405 uses styling cues from the smaller 305 and 365 models and it has their asymmetric deck arrangement too, which provides a deep, well-protected sidedeck on the starboard side and a more regular raised sidedeck to port. This wide starboard sidedeck combined with the door adjacent to the helm makes the Coupé range very easy to crew even if you are a singlehanded and the 405 should be no different. Anything with the blue and red of Nimbus on it is likely to be a practical delight and the 405’s single-level living spaces are bound to make it a very safe and easy boat to move around on. Things like the deep cockpit, plethora of handrails and the chunky black rubbing strakes around the boat’s perimeter all hint at a craft that is designed to be used and look after you at the same time. On board, the saloon will be sprinkled with sensible details and solid in that typical Nimbus way. The light bursting in from the whopping glass sunroof should be pretty spectacular too. Below decks, where there is unlikely to be quite as much access for natural light, there is a three-cabin layout comprising an ensuite master in the bow and a pair of twins sharing a bathroom amidships. A pair of dependable shafts on V-drives will put the power from the twin Volvo Penta D4 300s or D6 370s into the water and no doubt deliver the sort of glued-to-the-water driving experience that people buy these boats for. 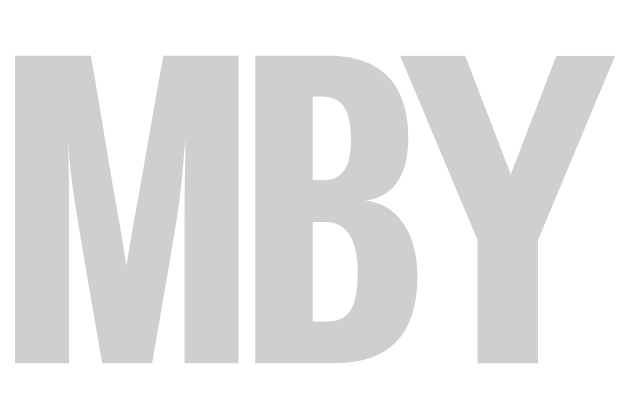 For more information contact the Nimbus UK importer, Offshore Powerboats. 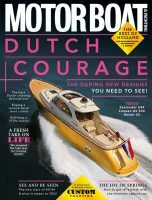 See the video of MBY’s test of the Nimbus 365 Coupé and one of the 405’s potential rivals, the Sabre 40.